to The WAREHOUSE SALE. 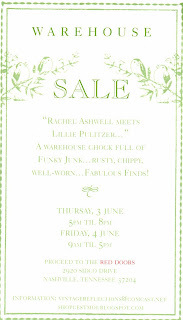 On Thursday and Friday, June 3-4th we are excited to once again be participating in Tawnya Nortons warehouse sale. 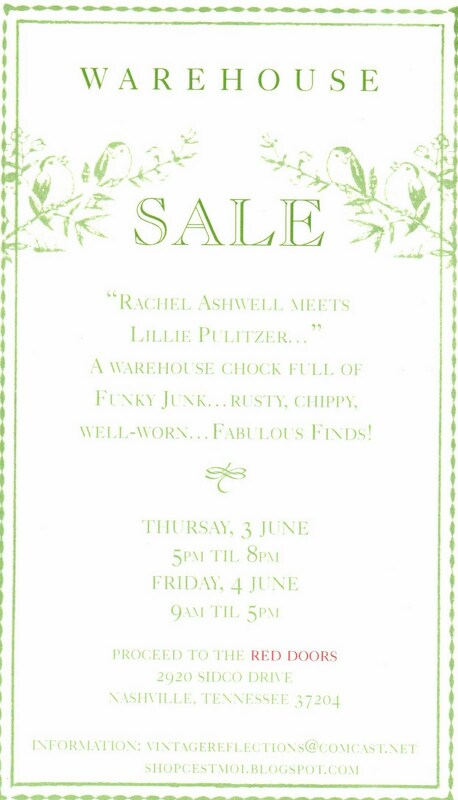 This month is sure to inspire you for summer with the promise of "Rachel Ashwell meeting Lillie Pulitzer". We are excited to be bringing some wonderful painted shabby chic pieces and a few surprises to boot. The sale in April was fantastic! There is one small change in that the sale this time will take place on Thursday evening and on Friday-no sale on Saturday. Mark your calendars-bring a friend-when these creative junkers get together it is a party!!! Introduce one of us from Three French Hens and The Roost to a friend you have brought along and receive 10% off any one item of ours. Happy Shopping !!! Historic Floods 2010...Three French Hens is BACK! How odd that I would use a "water" reference in my one and only post ...then almost exactly one year later we would face historic floods in our great city. As a native Nashvillian it is a very sad event to endure. SO MANY of our people are affected. Some losing a few things to many losing everything. I never thought a hurricane could hit Tennessee but it may as well had-the results are all the same. While being incredibly sad I am also so very proud to call myself a Tennessean. To see our community join together to help one another-we come by our name as the "Volunteer State" very honest and graciously. We will overcome this ! Please keep our wonderful citizens in your prayers-the recovery will be long BUT we will recover. Thank you so very much. As to Three French Hens we did have approximately one inch of water in many areas of the lower level of our almost one hundred year old building. Fortunately for us the old building is not level so the water receded about as fast as it came in when the rain finally stopped. We had a bit of a mess to clean up but did not lose anything so we were very fortunate. Thank you for following and supporting us-you are very appreciated. Above is a small vision of what Nolensville Tennessee endured.... no more water references from this hen! Happy -beautiful visions coming very soon. Have a great day.